After its initial introduction in the early 70’s by Johnny Cash, Willie Nelson, Waylon Jennings and others; the rowdy and rebellious brand of country music dubbed “outlaw country” has seen resurgence in recent years, spearheaded by artists like Chris Stapleton and Sturgill Simpson. 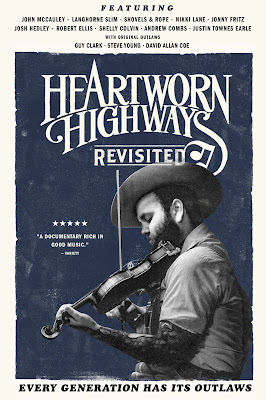 In 1975 the documentary Heartworn Highways dove into the subject following pioneers of the genre on the stage, in the studio and up close and personal at home and featured interviews and performances from Townes Van Zandt, Guy Clark, David Allan Coe, Steve Young, Rodney Crowell, Gamble Rogers, Steve Earle, Barefoot Jerry and the Charlie Daniels Band. To celebrate the film’s recent 40th anniversary, the original filmmaker Wayne Price has created HEARTWORN HIGHWAYS REVISITED, a new film that revisits the idea of the original film with new interviews from original outlaws Guy Clark, Steve Young and David Allan Coe while highlighting the next generation of Nashville-based "outlaws", with interviews and performances by John McCauley, Jonny Fritz, Nikki Lane, Josh Hedley, Justin Townes Earle, Shovels & Rope, Langhorne Slim, Robert Ellis, Andrew Combs, Shelly Colvin, Phil Hummer and more.